There we were... cruisin' down Broadway prior to Noodlemania, with empty stomachs. That was a very precarious situation as Emily and I were in the danger zone. Yes, the time just before a feeding, but being famished at the same time. What to do? Wait til Noodlemania starts or eat something beforehand, even though that would mean way too much food? 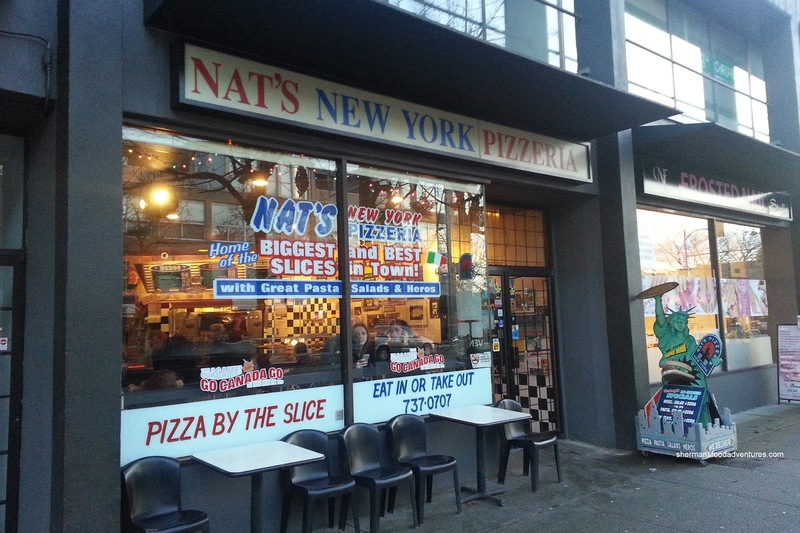 Well, there wasn't much debate as we stopped in front of Nat's New York Pizzeria for some pre-carbs prior to the main event full of more carbs! 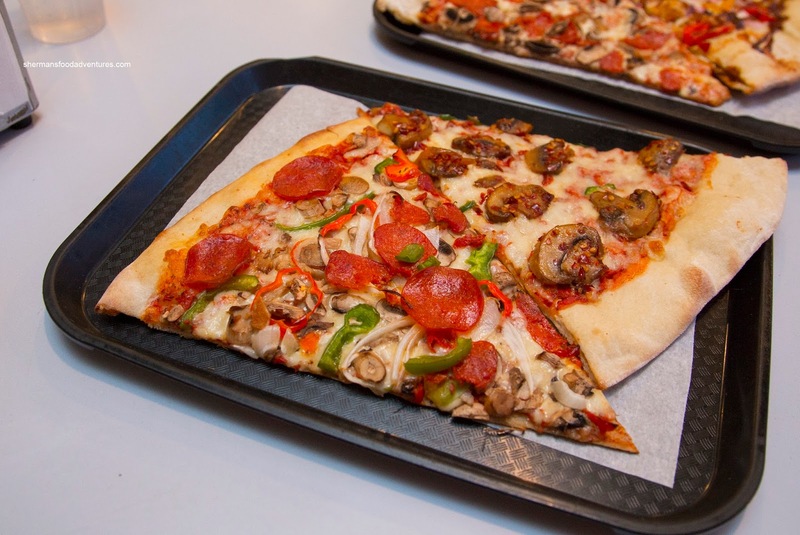 We decided on 2 slices each where I chose the Meat Deluxe and Spicy Mushroom. Seeing the usual ingredients in a deluxe, but with just lots of it, we found pepperoni, green and red peppers, mushrooms and onions. This loaded pizza surprisingly didn't get soft nor wet due to the heavy duty thin crust that was more crunchy than chewy (might've been due to the reheat). 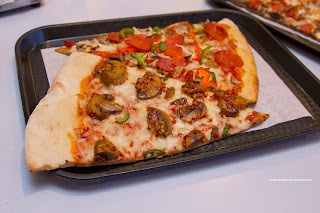 I personally loved the spicy mushroom as it lived up to its namesake with chili flakes, jalapenos and big meaty slices of mushrooms. It ate rather hearty for a non-meat pizza. There was a noted spiciness from the first bite that lingered way past. 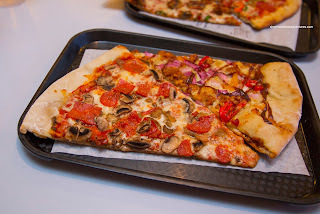 Emily's 2 choices included the Chorizo Mushroom and BBQ Chicken. Not as spicy nor impactful as we would've expected, the chorizo did eat heartily with lots of toppings that included an equal amount of mushrooms. Again, the crust stood up well to the amount of ingredients. Lastly, the BBQ Chicken consisted of chicken bits, red onion and peppers. We liked how they were conservative with the sweet BBQ sauce. 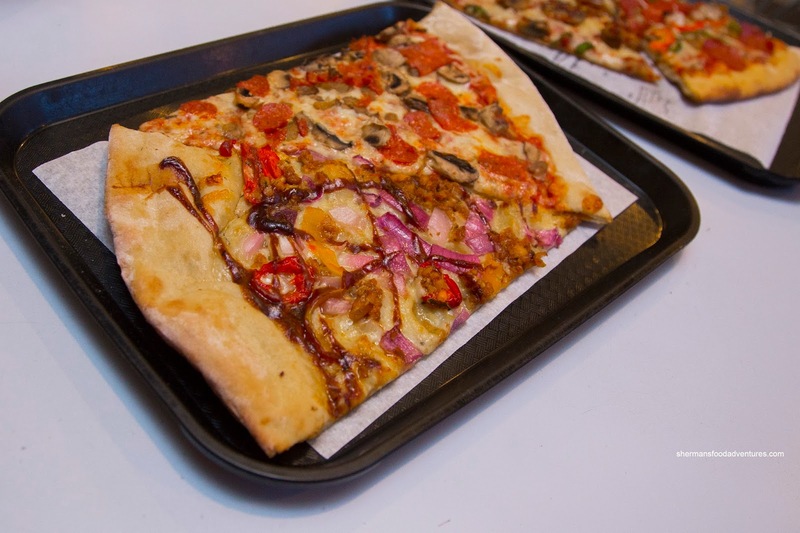 I personally would've liked to see less onion as it dominated both texture and flavour. Overall, we were satisfied with the slice pizza we ordered. I didn't necessarily bring back memories of my past visit to NYC, but it did the job for a reasonable price.